Fairground entertainer Burghard-Kleuser from Dortmund (DE) is exploiting the ferris wheel "Roue Parisienne" and has for the transport of this ferris wheel some trucks in use. 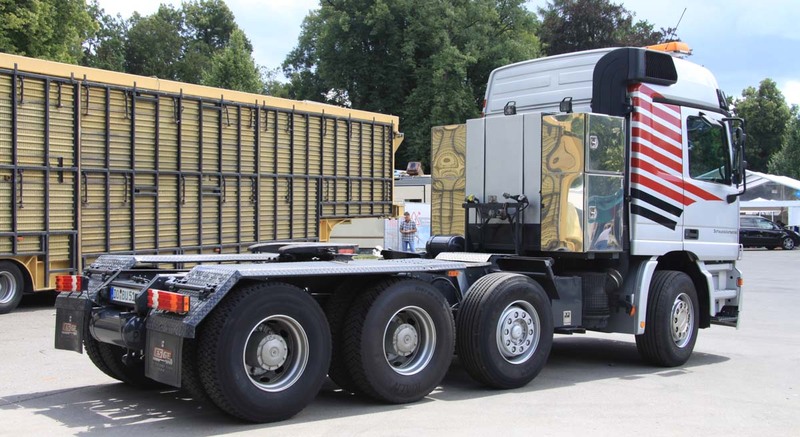 This Mercedes-Benz Actros 4157 truck is used to transport one of the A-frames. In the background the Actros 2657 with lorry crane. It is a 8x4 truck that is powered by a Mercedes-Benz OM 502 LA, an 8 cylinder diesel engine with 15.9 liter stroke and 571 hp. 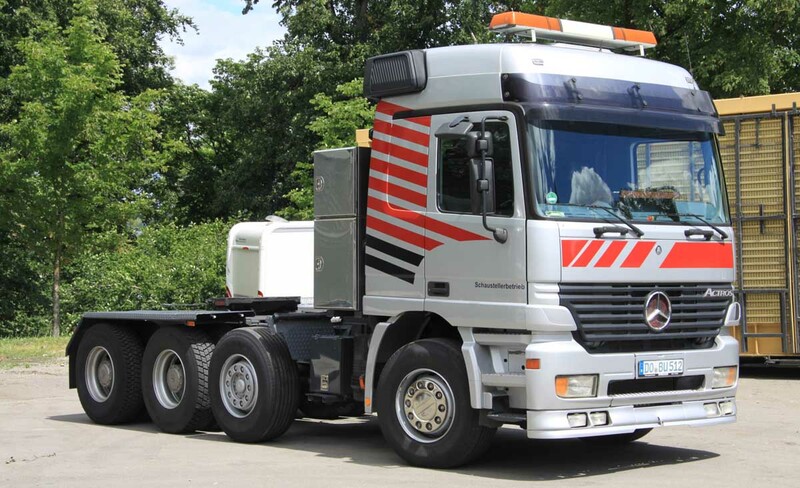 That is the heaviest engine that was available for the Actros MP1, that was built between 1996 and 2003. 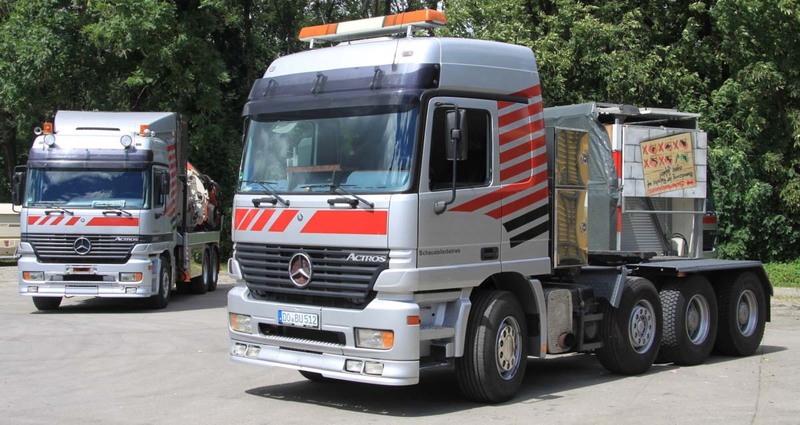 This truck was bought new by Brande Maskintransport A/S, then the truck was used shortly by Nolte Krane from Hannover (DE) and now by Burghard-Kleuser. Behind the cabin is in the middle a large diesel tank made, left and right two large storage compartments. Here is the 4 axle trailer attached. The ferris wheel exists out of three trailer that are parked next to each other. The outer two are the hydraulic A-frames. In the middle the trailer with the spokes. 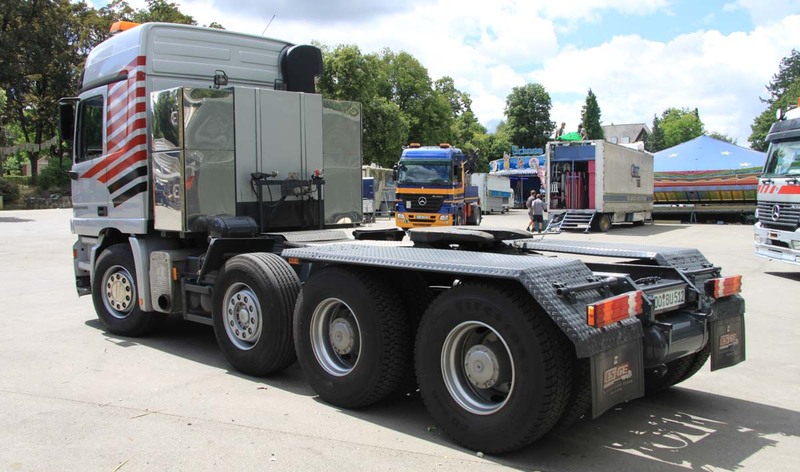 The other trailer with A-frame is pulled by a 4 axle DAF XF 105.510. At the front and the back are two large supports made, the trailer will be part of the ride. The ferris wheel has fully erected a maximum height of 45 meters and was made by Mondial by Heereveen (NL). An interessting and sharp combination.